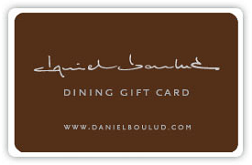 Nothing is a better match for your generosity than the gift of dining in a restaurant by Daniel Boulud. WE CANNOT PROCESS INTERNATIONAL ORDERS THROUGH OUR WEBSITE. FOR ALL INTERNATIONAL ORDERS, PLEASE CONTACT US AT GIFTCARDS@DANIELNYC.COM. NOTE THAT ALL INTERNATIONAL ORDERS WILL BE PHYSICAL CARDS ONLY WITH APPLICABLE SHIPPING FEES. THANK YOU.